This brave German Shepherd sits calmly with her owner - just minutes after burglars stabbed an eight inch blade into her skull. The six-year-old family pet, named Bella, needed emergency surgery to remove the protruding knife after the horrific incident on Saturday. This shocking picture shows how the robbers narrowly missed the animal's eyes as they plunged the deadly blade into her forehead. Today Bella's owner Vernon Swart said he feared the worst when he saw the knife sticking out of her skull following the attack at his home in South Africa. 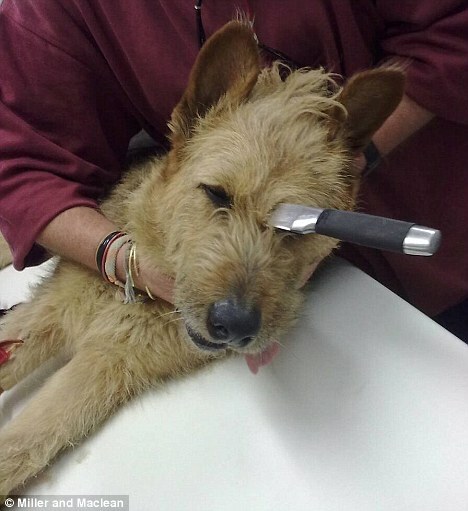 He said: 'I was in the house on Saturday morning when the neighbours called to say our dog was running around in the street with a massive knife in her head. 'I didn't believe them but when I went outside I saw it for myself. 'The neighbours said they had caught intruders trying to enter their home and they must have then tried to get into my place when Bella attacked them in our garden. 'One of them had stabbed her right in the head and the end of the knife was poking out between her eyes. Mr Swart, a professional artist from Stellenbosch near Cape Town, said he rushed Bella to the vet for surgery after the stabbing. He said: 'My wife was at work but she came home and we drove down to the vet. 'Stella was on the back seat and every time she turned her head the handle of the knife banged against the window. 'She obviously couldn't feel anything as she was acting normally, but it looked horrific. 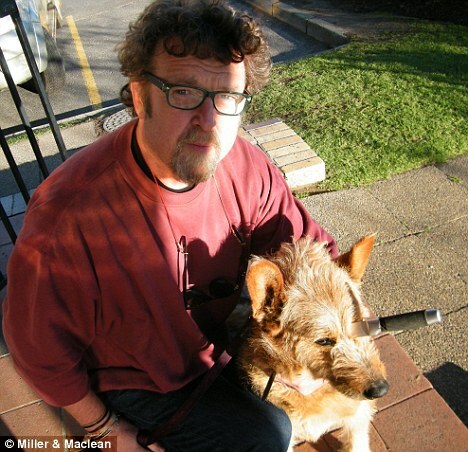 Sickening: Vernon Swart with his Bella while she had a knife in her head 'The vet couldn't believe what he was seeing and said he had no idea how Bella had survived. 'He put her under an anaesthetic and then pulled the blade out. 'It was imbedded so far into her skull that he had to put his knees up against Bella's head and lever it with his arms. 'When we saw the size of the knife we were absolutely shocked. The eight inch diver's knife was later handed to the police as evidence after the surgery. Detectives confirmed they had opened a case of malicious damage to property following the incident. They were today hunting for the suspected thieves, who ran away after the attempted break-in. Meanwhile Bella was recovering at home after her ordeal. Mr Swart said: 'She's been lying beside the fire and we've been treating her to all sorts of nice food, but she seems absolutely fine. He added: 'We're just so relieved that she's okay. 'She's been with our family for ages and we'd have been devastated to have lost her.